This new example (thanks, Steve) is funnier than the original #17, mainly because nobody died. 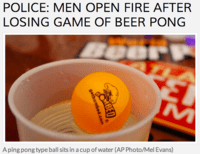 Had I foreseen that beer pong would be the cause of another potentially life-threatening dispute, I'd probably have waited, but such are the decisions that life presents. Let history judge. This one broke out in Texas (also funnier) although the shooters are said to be from the Cleveland area (funnier still). Exactly what they were doing at this house party—about a mile south of Ames, Texas, which is about two miles east of Liberty, which is east of Dayton, all of which is somewhere northeast of Houston and therefore in the middle of nowhere, is what I'm trying to say—is not explained in ABC11's report. The report says that five men were attending a "large party" at a home there, which also seems awfully unlikely given that Ames has a total population of just over 1,000. Wait—this just in (into my brain, because I kept reading the Wikipedia entry): "As of 1995, of all Texas counties, Liberty County had the fourth largest number of state prisons and jails," one of which is located in Cleveland, Texas. Mystery: solved. 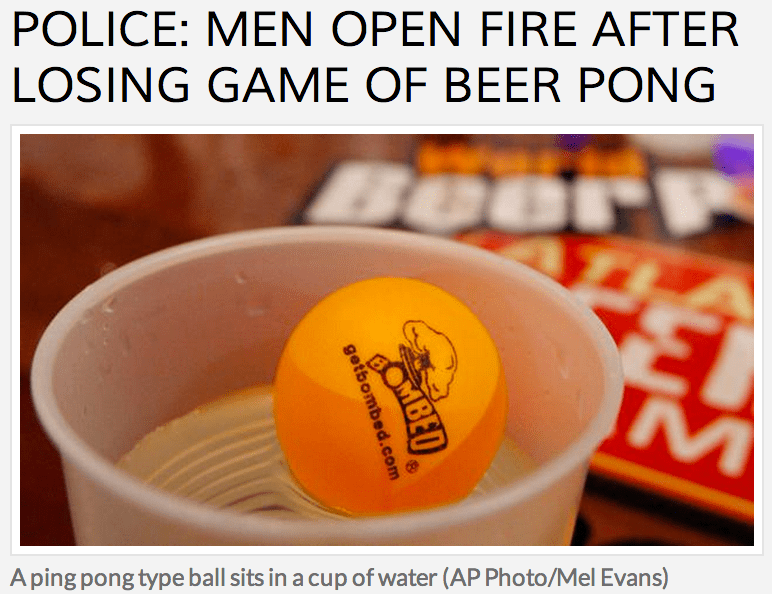 Anyway, the report also states that early Sunday morning, the group was engaged in a match of beer pong at said jamboree. "The men then got upset after losing the game, pulled out weapons and began shooting wildly at the crowd as they ran to their car." This is also sometimes referred to as "a Texas goodbye," or at least I just decided to call it that. Two people were hit in the leg, but both are expected to recover. Deputies are now searching for Decoris Lamont Rucker Jr., AKA "Red," and Chris Hackett, AKA "Crazy Chris." Both men are from the Cleveland [Texas! probably] area and were seen leaving the party in a 2006 four door Buick, silver in color with temporary license tag number of 34P6604. Anyone who knows the men's whereabouts are urged to call the Liberty County Sheriff's Department at (936) 336-4500. Please do not try to apprehend Red or Crazy Chris yourself, for reasons I hope are obvious.